Home > Unplugged > Life Things > Joseph’s 4th Birthday! 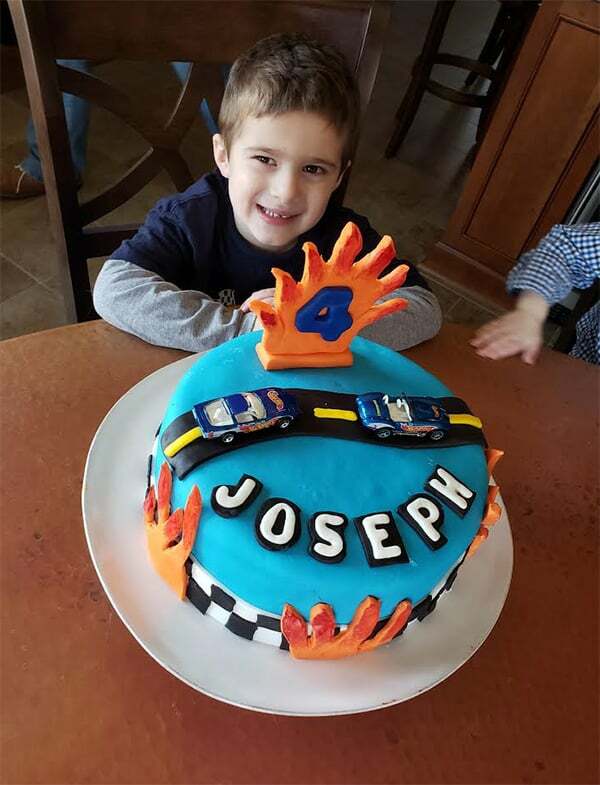 Joseph turned FOUR(!) on Saturday, January 19th and while we had originally planned on throwing his party that day, a forecast for a massive winter storm convinced us to postpone it until the following week. 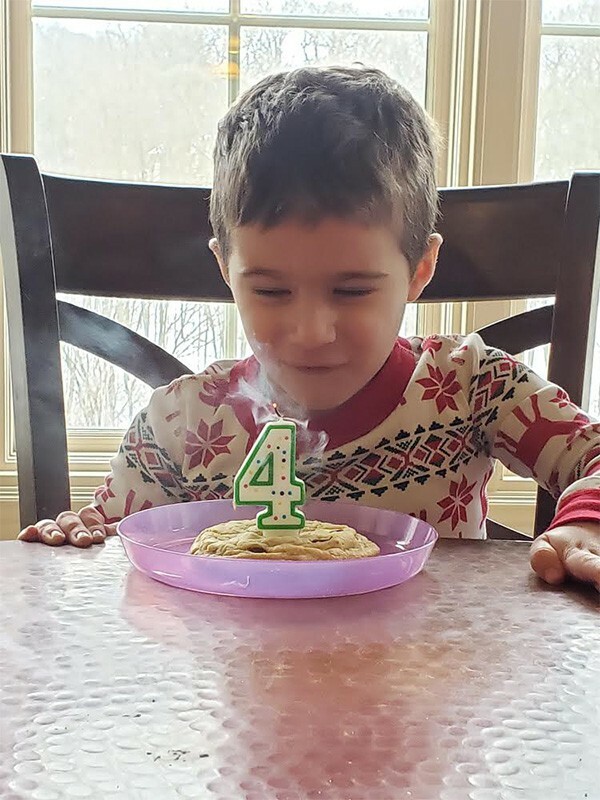 Naturally, we didn’t get a single flake of snow on his birthday, but we had a great day at home staying in PJs, opening some presents, doing all of his favorite things, wearing his birthday crown from school, and singing to him with a candle in a homemade chocolate chip cookie (his request). Then, last weekend, we held his official party and he was SO excited. Of course I wanted to share the details with you! 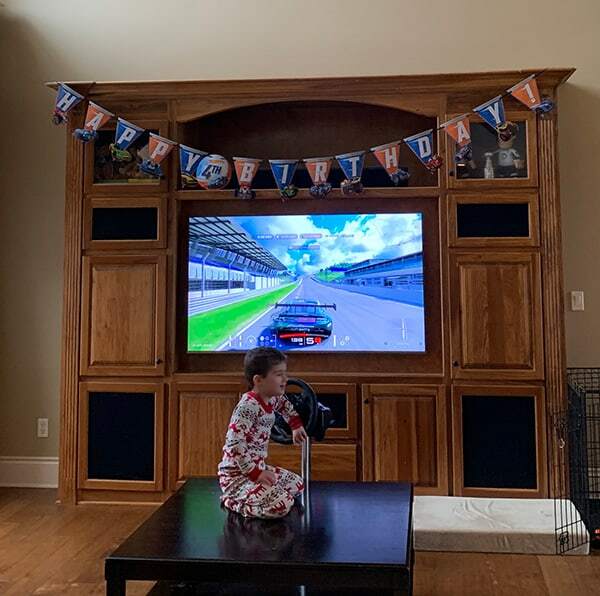 This child could not possibly be any more obsessed with cars. Matchbox cars, Hot Wheels, Formula One cars, he LOVES them all. So it only took a hot second to decide on a Hot Wheels themed party. 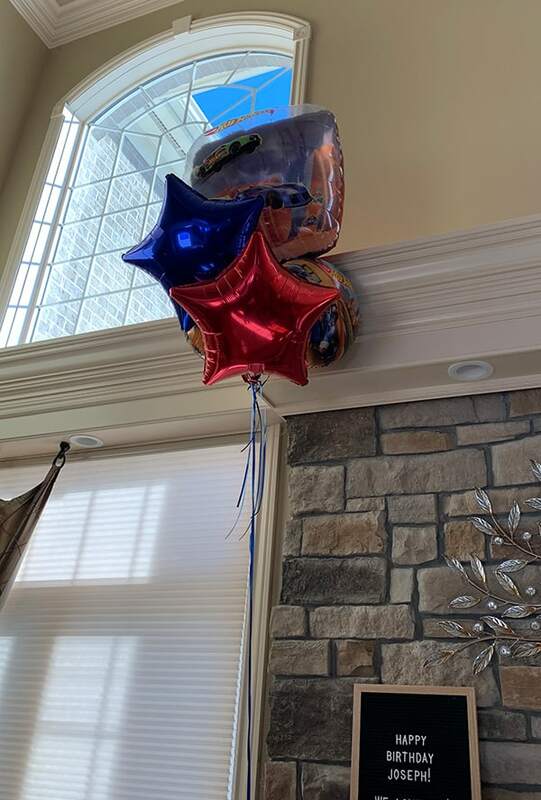 I hit up Party City and got a Happy Birthday banner, along with the obligatory coordinating plates and napkins, as well as two sets of Hot Wheels and race car balloons. 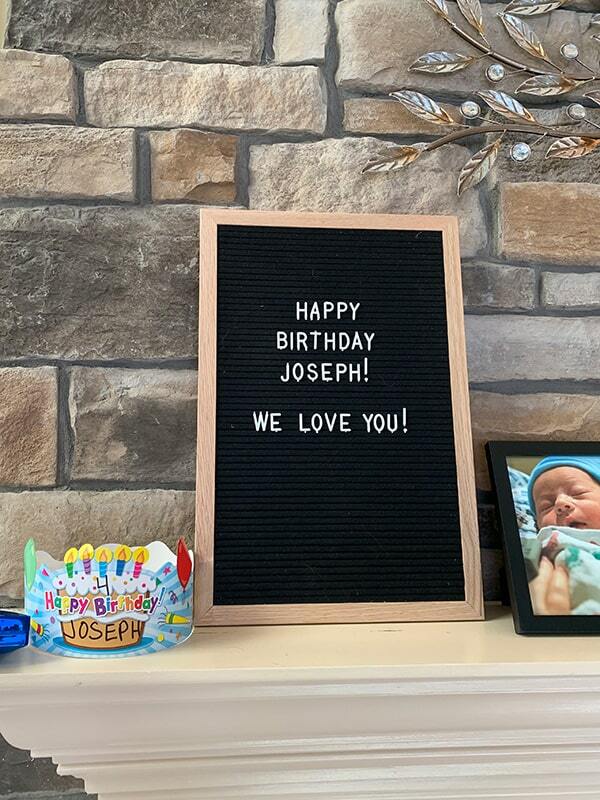 We had a special birthday message on the letter board I got for Christmas, as well as some framed photos of Joseph from the day he was born, then each of his previous birthdays, as well as a recent photo. I just adore looking at those pictures! We ordered an assortment of food from a local restaurant including ribs, a southwestern mac and cheese, mashed potatoes, salad, and cornbread. Everyone LOVED seeing ribs! We’ve been switching up the food for our last few parties, trying new places and different things. Variety is the spice of life! 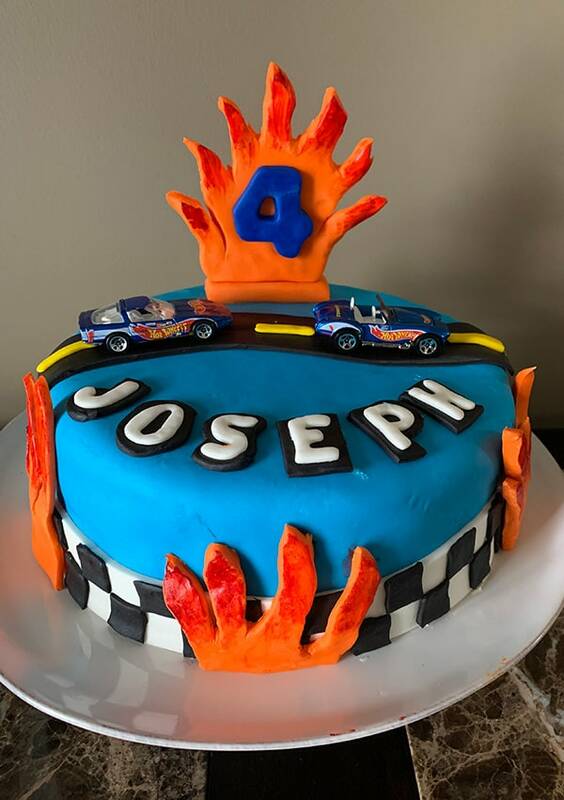 I covered the cake in light blue fondant, then decorated the bottom with a white and black checkered border, some flames, then put a road on the top with a couple of new cars for the birthday blue, and finished it off with a big flame standing up on top with the number “4” inside. Usually I end up staying up until midnight finishing the cake the night before the kids’ birthday parties, but this time my husband encouraged me to work on it in the afternoon while Isabelle napped and he kept the boys busy so I wasn’t burnt out in the evening. I was SO grateful for his suggestion, and it was awesome to relax in the evening. Since Joseph was around while I was working on the cake, he kept wanting to see it, and wandered into the kitchen multiple times saying, “mommy, thank you so much for making my birthday cake for me!” I love that little guy so much. On the inside, Joseph requested a chocolate cake, so I made the simple two-layer Hershey’s perfectly chocolate cake, and filled and frosted it with a double batch of my favorite vanilla buttercream. I also added a half-batch of Rice Krispie treats because, well, it was a kid’s birthday party, and my husband and I absolutely love them, too! I used the old-school paper and pen invitations that went along with the Hot Wheels theme at Party City. I started getting custom birthday t-shirts since Joseph’s 2nd birthday and I just love it! 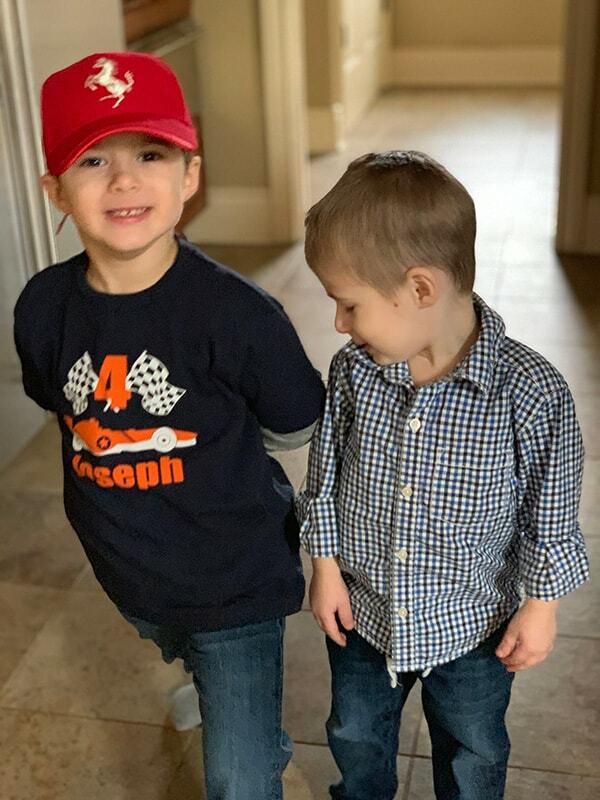 I bought this race car shirt on Etsy, and Joseph was totally enamored with it. Joseph has definitely reached the age where he’s super excited about things and understands events, holidays, birthdays, etc. It was so fun for me to see him be so enthralled with his party, but also be so gracious and thankful for the gifts he received. Celebrating birthdays always makes me relive that insanely special day, as well as the days leading up to it and the days following. 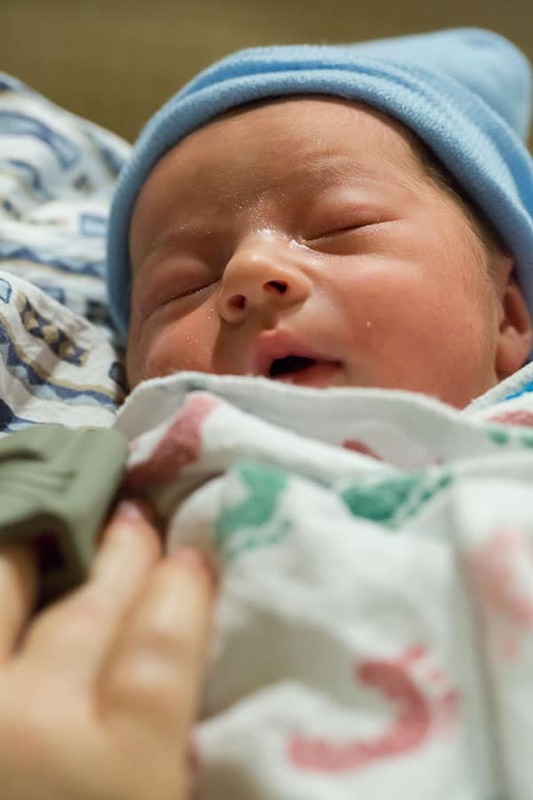 Joseph was our first baby and we truly had NO idea what to expect, but boy oh boy, did we fall so in love with that little baby immediately. He continues to make our world brighter every single day – he asks for spontaneous hugs and snuggles, he sings Christmas carols all year long, and hearing others talk about what a sweet boy he is just makes me beam with pride. I often wish I could go back to that day, and the days following, just to experience the newness all over again. What a special time that I’ll always and forever remember. It gives my heart a pang when I read your wonderful posts about your children! I felt just the same about mine, now fully grown. It’s great that you take so many pictures, because I’m constantly amazed by what my children DON’T remember! But they have their own memories . . . Thank you for sharing!! Cheers! Belated happy birthday to Joseph. He is so cute and sure has grown. 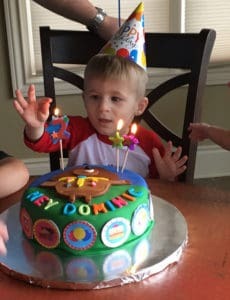 Love the cake you made for him. Time goes by so fast. My nephew just turned 23 on January 29. I can’t believe that he is that age. Seems that he was still in college. Love reading your blog about the family. Keep letting us know. He is a sweet boy thanking you for the birthday cake you made him. You have raised him right. Michelle, you have such a beautiful family! This was one of your sweetest posts!!! Motherhood is so rewarding if you do it right…and you are such a wonderful Mom…doing all the little things that add up to adorable kids! I am a Grandma of two with one on the way and my daughter-in-law is just as sweet as you….what a lucky family! Wow you are quite the cake baker! You should be in business making them for other people. I saw Dominic’s for his 3rd party and it was really nice to. Your children are lucky they have such a talented Mom. I have been following your blog way before you were married. 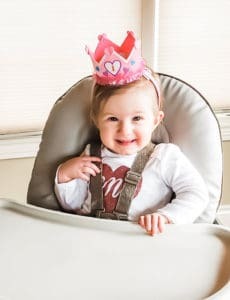 One of the best blog’s on the internet! Joseph is a breath of fresh air every time I see pictures of him. He is beautiful and seems like a wonderful, kind and happy little boy. You are a fantastic mother and I look forward to reading all that you have to say about your life and mostly about your lovely children!!! Keep up the good work!! What a fantastic cake. Absolutely beautiful. 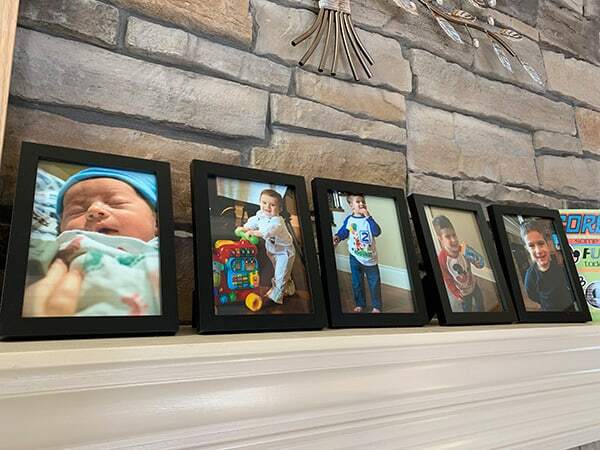 I LOVE the way you are recording the lives of your children. That will mean soooo much to all of you in the future. 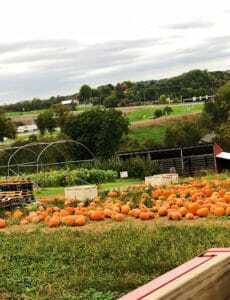 So wonderful to have the yearly photos and thoughts. I wish I had done that with my children……Oh….love your recipes too. Great job on Joseph’s birthday theme! Your cake is also beautiful! You are an amazing Mother and I’m awe of all that you do with your blog, your children, your pets, your husband and your family! Your posts are usually the 1st thing I read when I see your name in my in-box. Keep up the great work – and stay warm! Well, that just made my day….such an awesome reflection of the love of a mother….thank you, Michelle. Have a blessed day! What a seeet post & happy birthday to him! You’re so right about wanting to go back in time to re-experience those times; I think about that as well! Hi Michelle, having ‘been with you’ since before Joseph was born (and Dominic and Isabelle, too!) and when dear Einstein was still around, I share your nostalgia. The photos brought alive those days and I relived some of the wonder and discovery you shared with us all. May the family (and sweet little Jospeph, particularly, on his birthday) be blessed always. Stay happy and keep sharing the fun and food always!